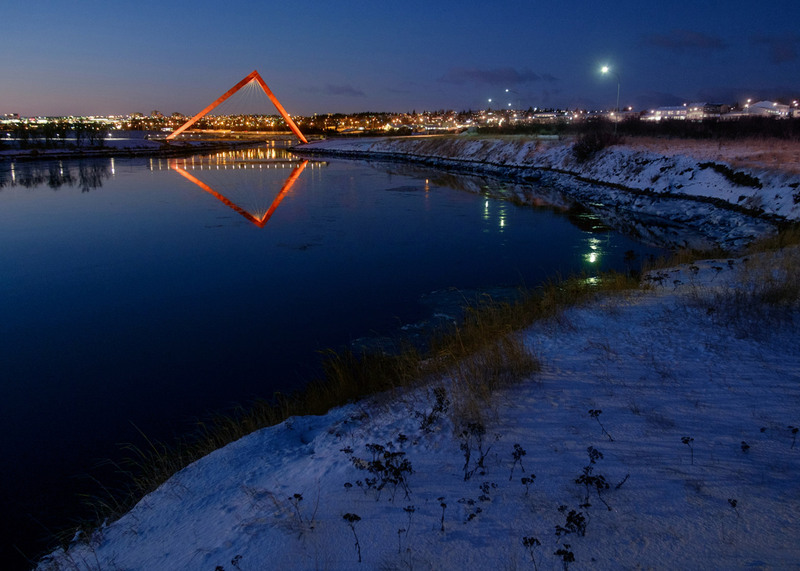 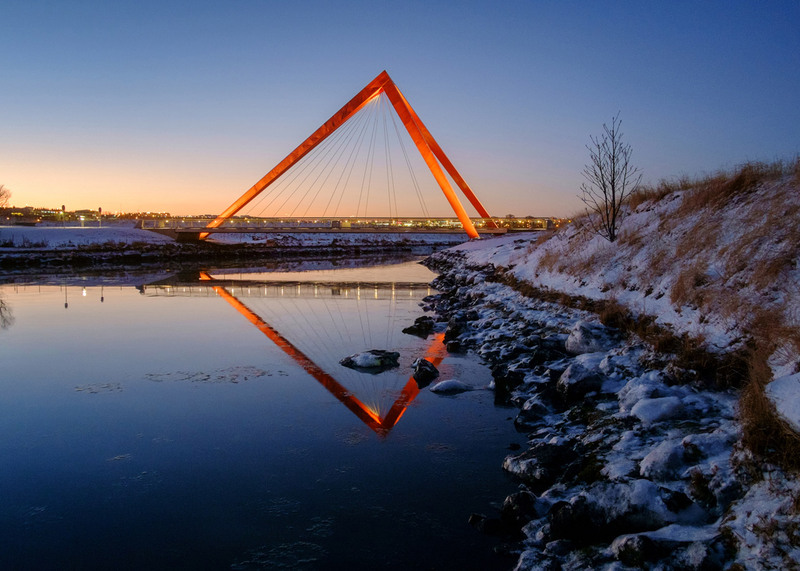 A pair of hollow red pyramids support the weight of these bridges that span the mouth of the river Elliðaár in the Icelandic capital (+ slideshow). 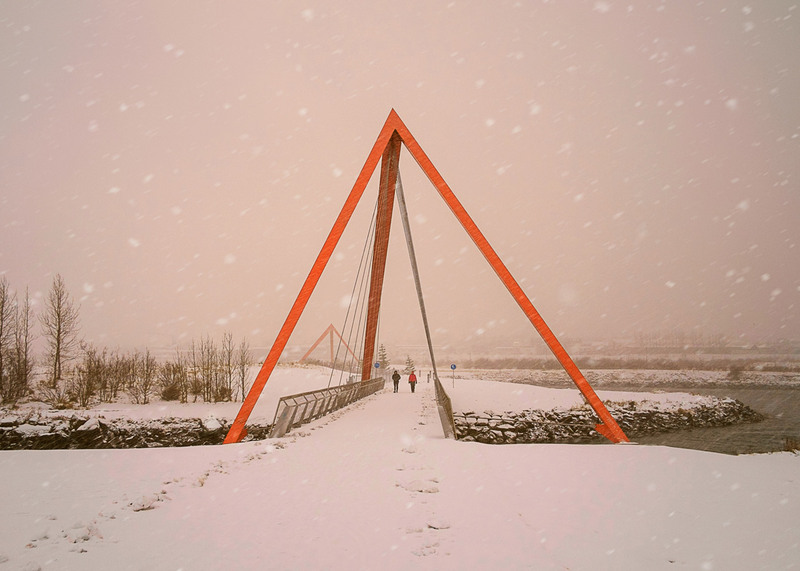 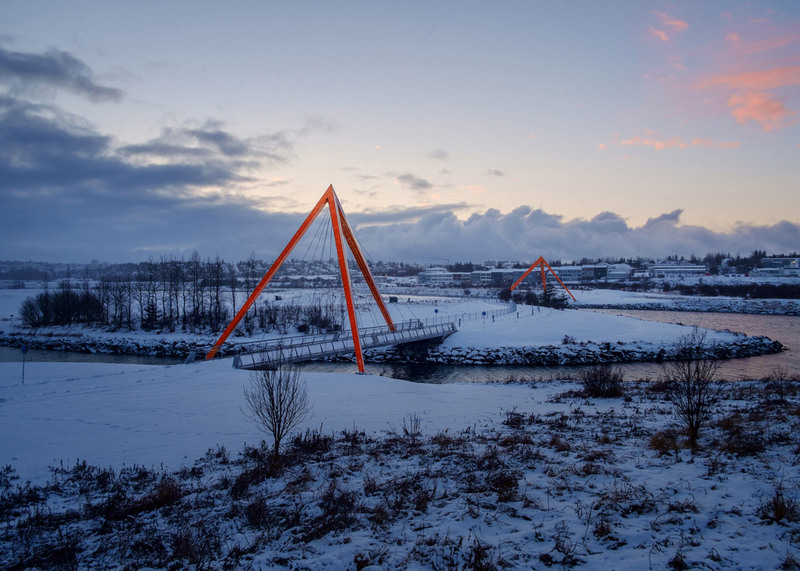 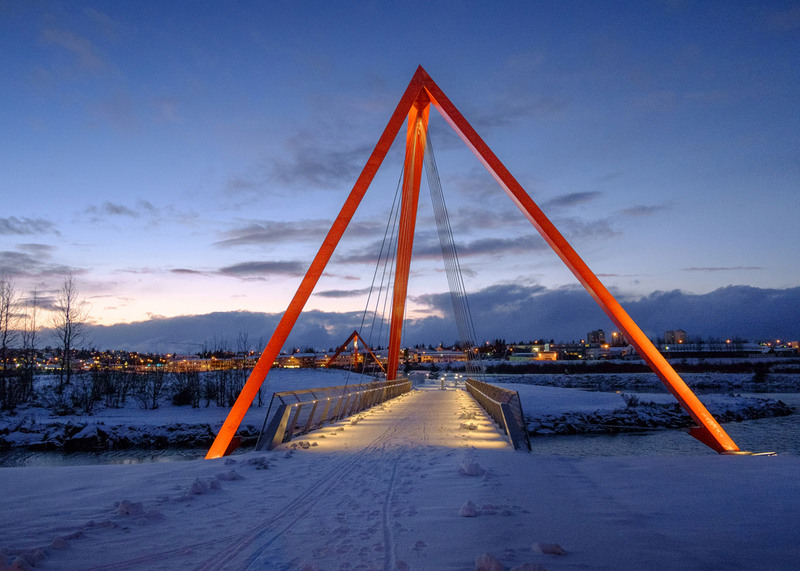 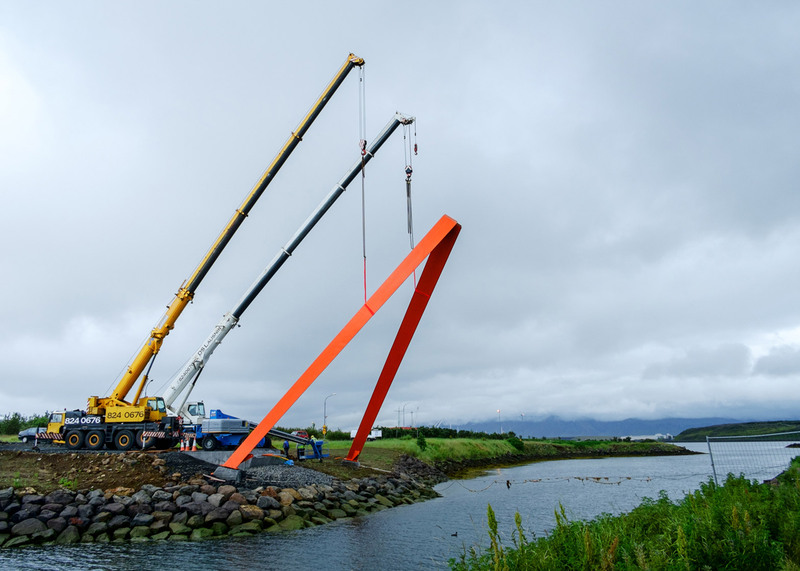 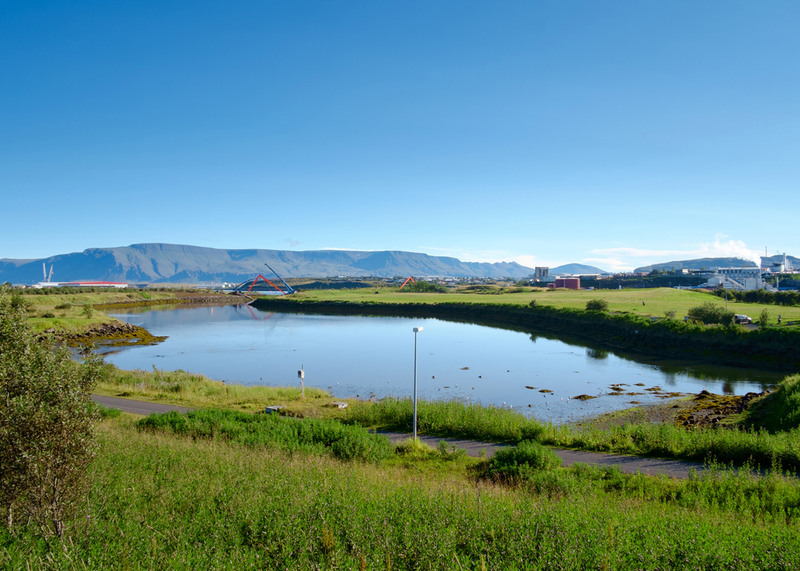 Designed by local firm Teiknistofan Tröð, the two bridges create pedestrian and cycle routes across the tidal estuary of Elliðaár – a river that runs down through Reykjavík from the volcanic mountain range of Bláfjöll to the south. 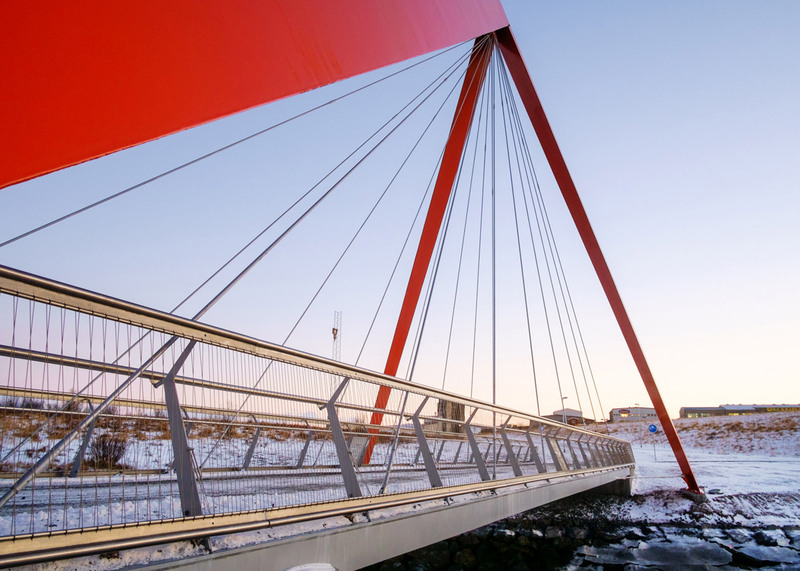 The river is split into two, hence the need for a pair of bridges. 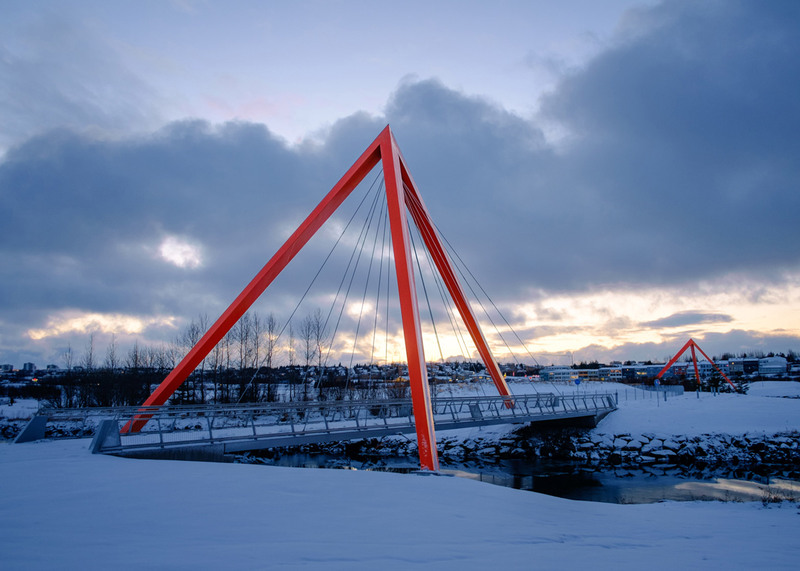 But the halves are similar in width, meaning it was possible to create structures that match one another. 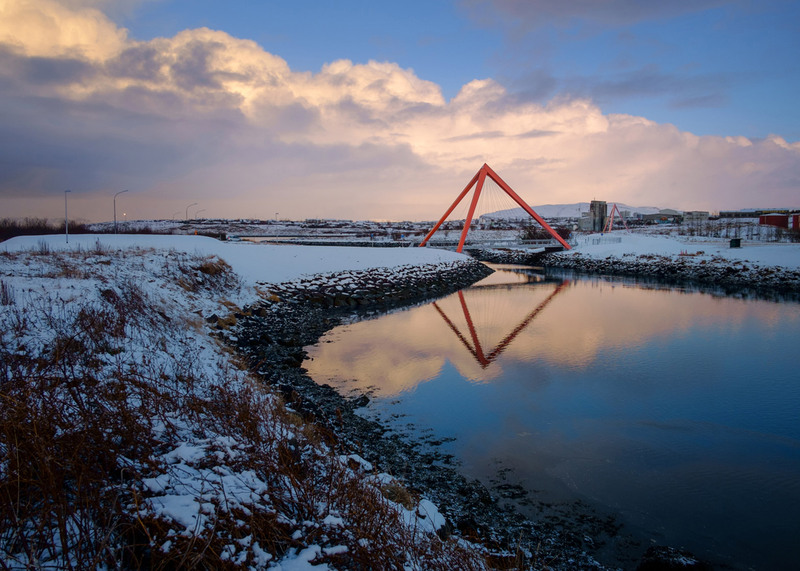 Both structures are supported by a tilted pyramid, each constructed from a trio of red-painted steel columns that vary in length. 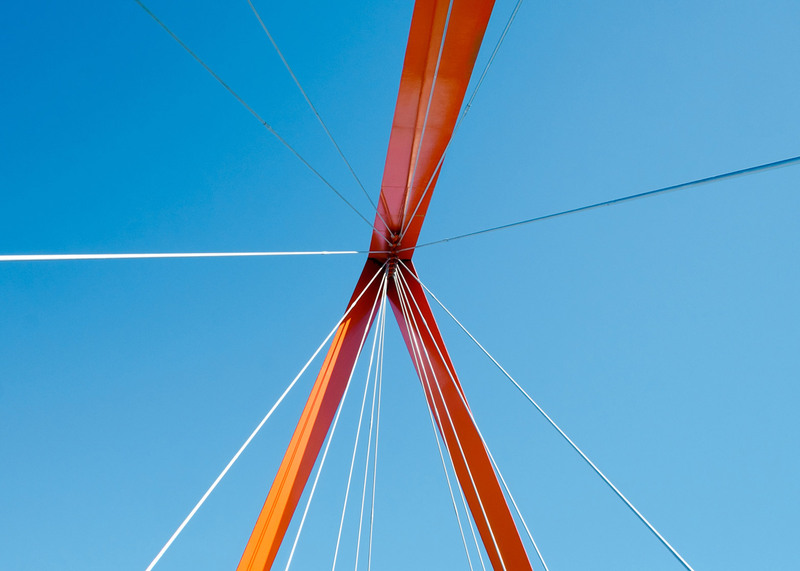 Steel tension rods extend down from the top of the pyramids to hold the 36-metre-long decks below. 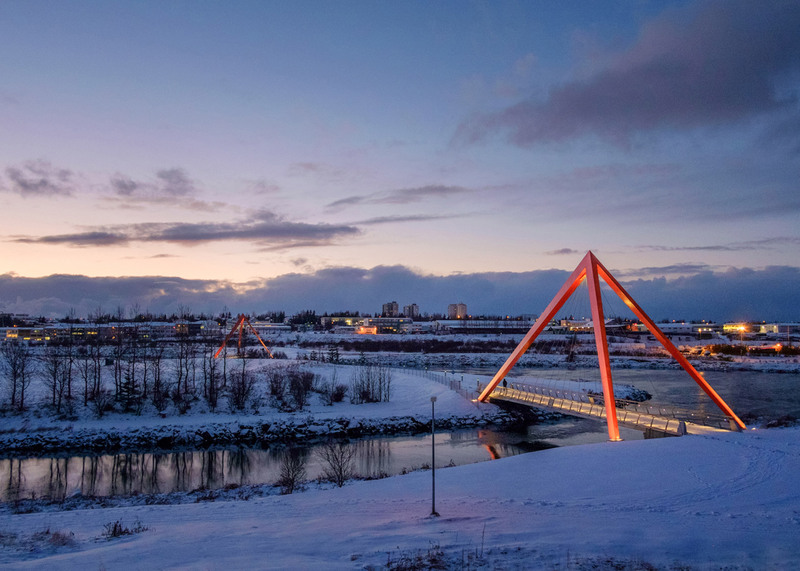 "The two bridges are identical in shape but mirrored, and their appearance varies from different angles," said a statement from Teiknistofan Tröð. 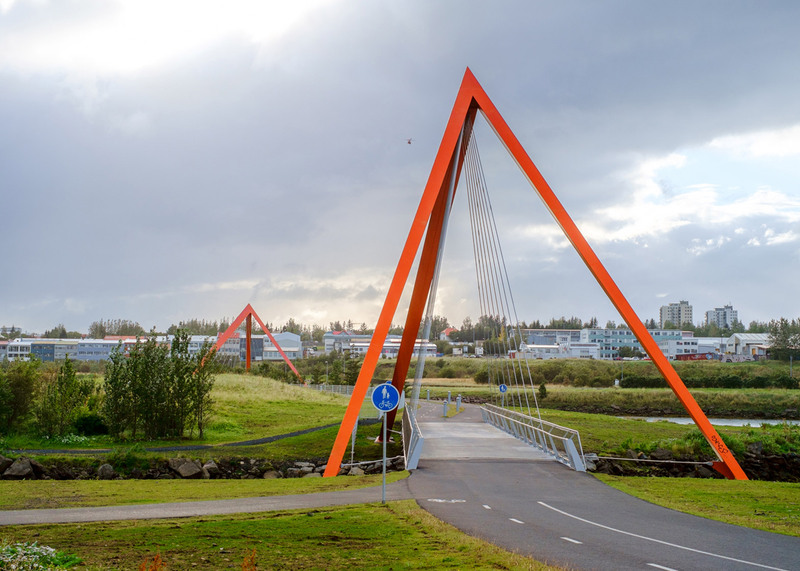 "The goal was to minimise the use of material by giving the bridges a basic shape that also becomes their identity," it said. 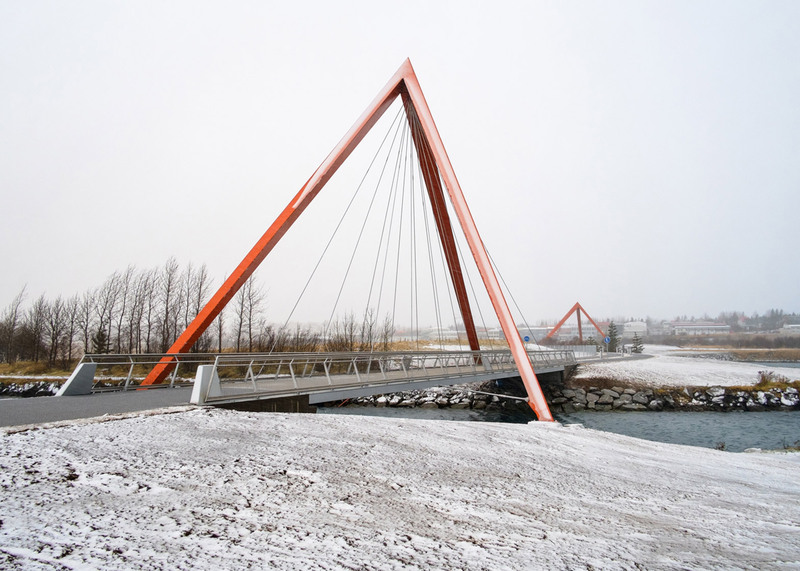 "The stable basic structural systems allowed material usage and construction cost to be minimised." 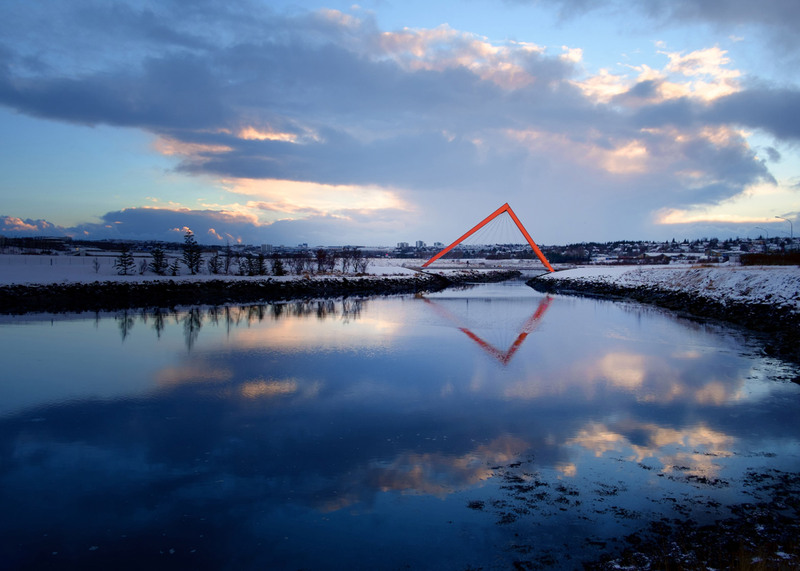 Pile foundations on the river bank help to anchor the bridges to their site, while the decks consist of hollow concrete slabs with sloping surfaces that help rainwater to naturally drain off. 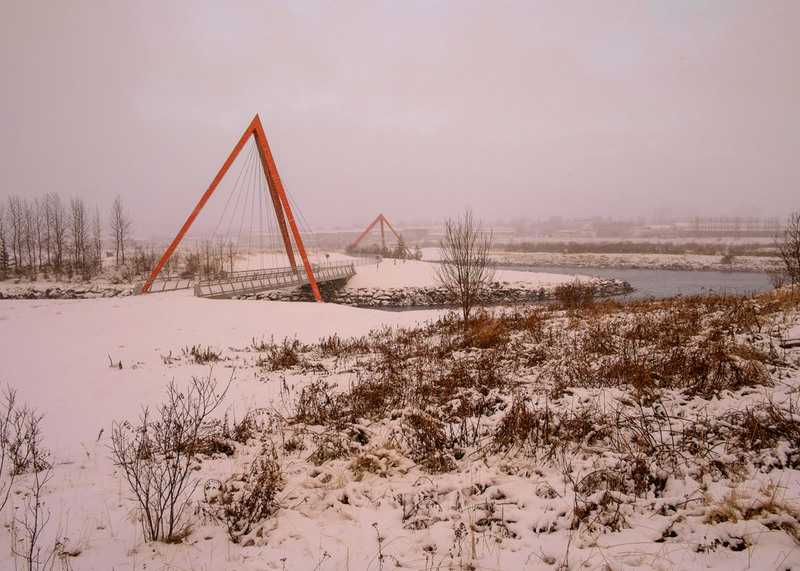 The project was completed in 2013, as one of the first steps in a plan to upgrade the Geirsnef peninsula and its surroundings, which combine a natural environment with a "rough" industrial area. 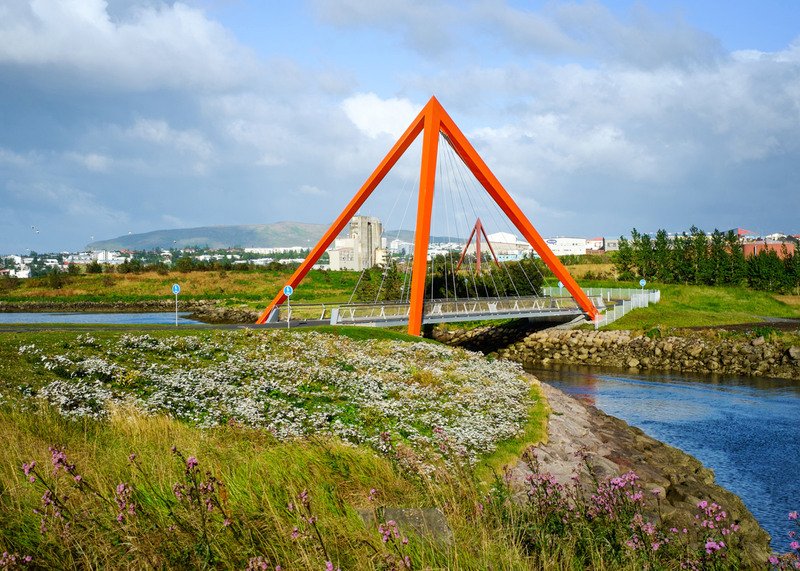 "The new pedestrian and cycle bridges present a positive change in form of transport," said the architects, "but simultaneously by choice of materials, colour and the shape of the bridge structure, they have clear reference to the surroundings and the history of the site." 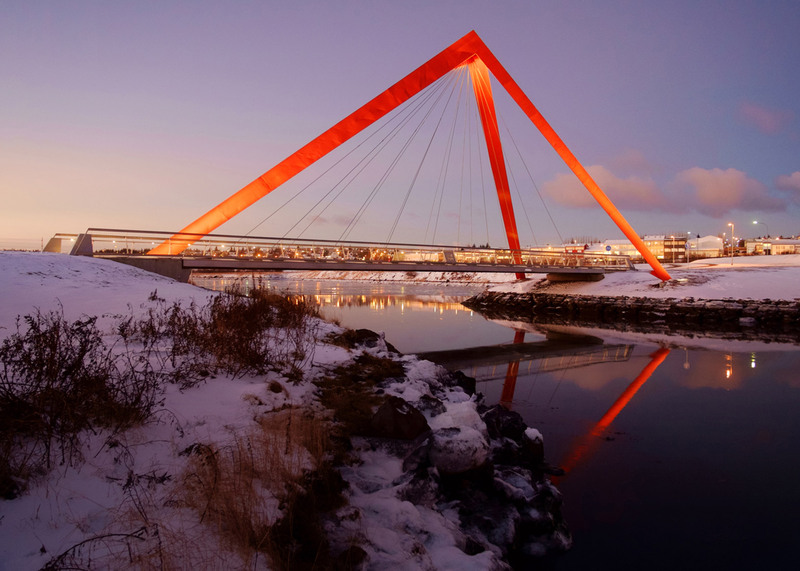 Elliðaár is also hugely popular with anglers, so lighting for the bridges had to be as non-disruptive as possible. 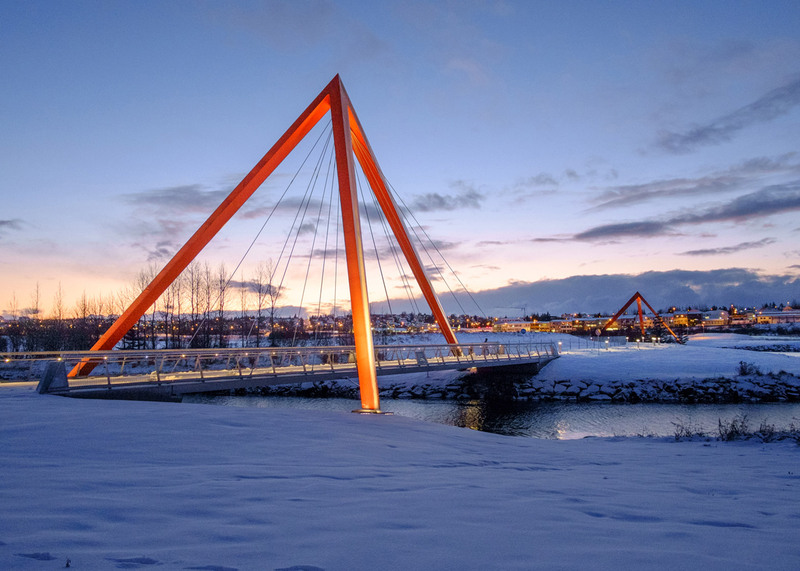 To achieve this, LEDs were recessed into the handrails, and illuminated bollards were installed along the pathways. 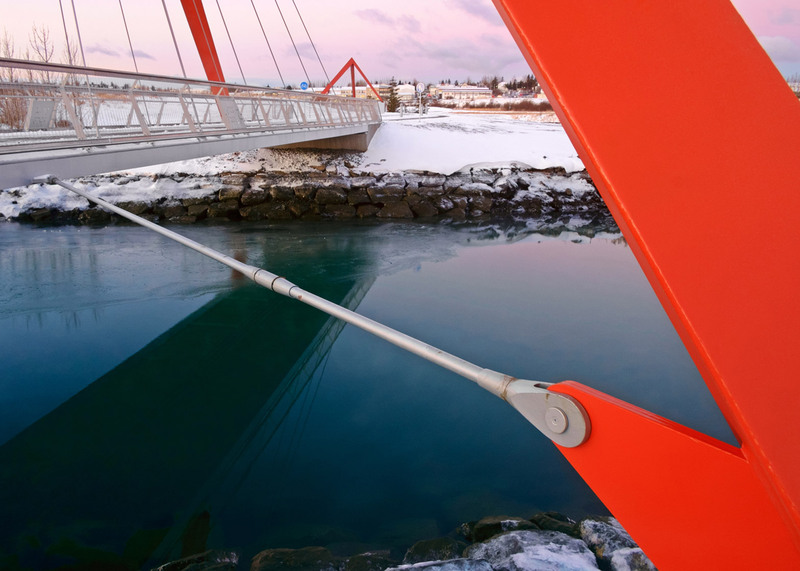 Red is a popular colour choice for bridge designers. 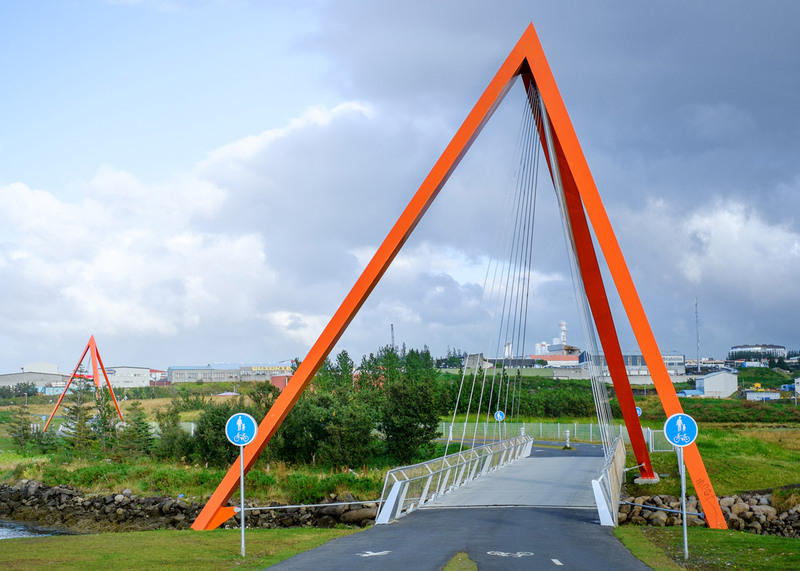 Teiknistofan Tröð's design joins a list including a railway crossing in France by Bernard Tschumi, a series of garden bridges in China by West 8, and a structure made out of paper by artist Steve Messam.